Have you ever had a disappointing grape? You know the ones that look all plump and crunchy but when you bite into one it’s just a bit…soft? I ended up with a punnet of them the other day – tasty looking but just didn’t hit the mark. But I hate wasting food, I will go to great lengths to attempt to use up anything that would otherwise be thrown away (unless it’s actually gone mouldy, I don’t go quite that far…), so I racked my brains to try and come up with something to do with them. 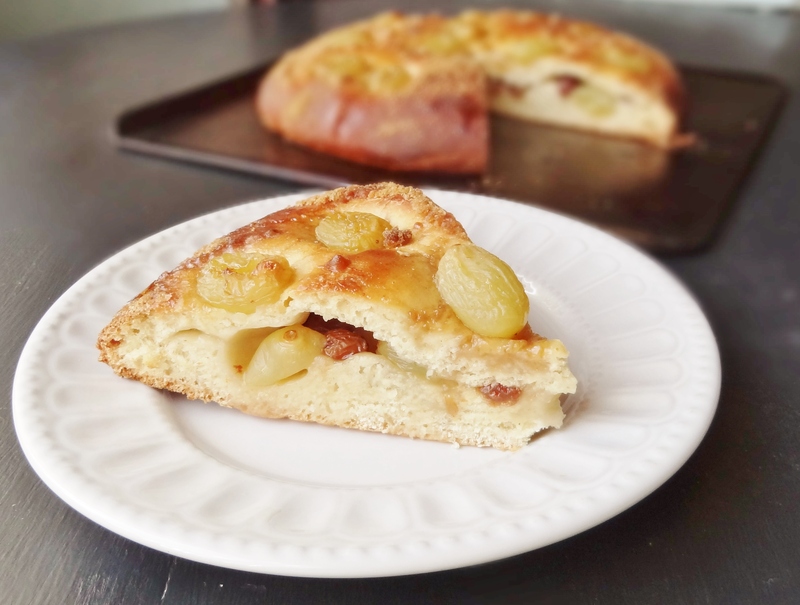 There aren’t many recipes that use cooked grapes so I was left with a choice between cake and bread; I wasn’t in the mood for cake so bread it was. What I came up with is a take on Italian Schiacciata all’uva, a red grape flatbread similar to foccacia. 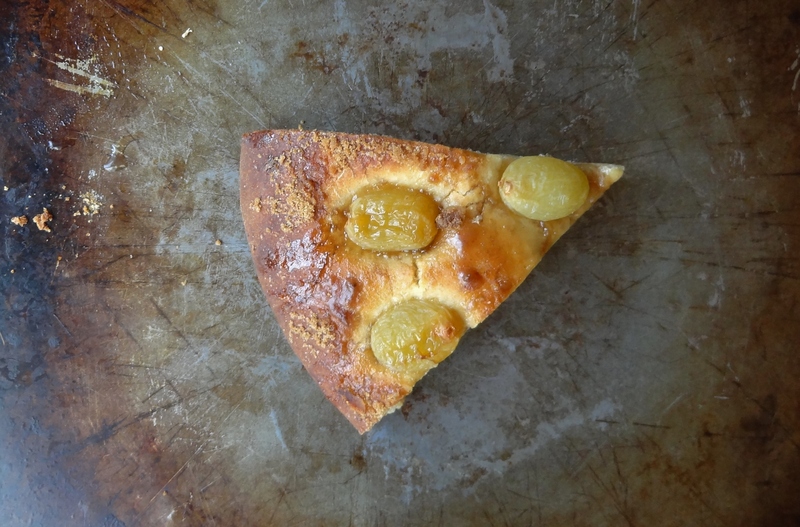 This is by no means an authentic recipe, I changed up the dough somewhat, adding a bit of semolina for flavour and a chewier crumb, and my grapes were green, but I do imagine that it would be far superior if baked with black or red grapes. 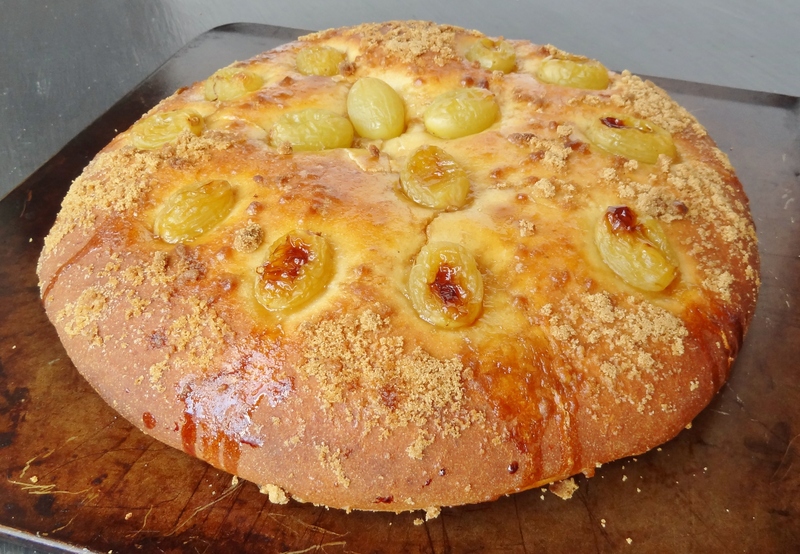 The bread consists of two layers of dough with grapes and raisins in the middle and more grapes and sugar on the top which collapse into bubbles of sweet, sticky juice which caramelise slightly when the loaf is baked. But despite the grapes and the sprinkling of sugar it is not overly sweet, making it a perfect treat for breakfast or a mid-morning snack. I wasn’t originally planning on blogging this recipe, as I didn’t expect it to turn out that well but I was pleasantly surprised by the result and it is very tasty! Place the flour, semolina, yeast, salt, sugar, olive oil and ground fennel seeds in a large bowl, add two thirds of the water and mix to combine, add more water as needed to bring everything together into a soft, slightly sticky dough. Turn out onto an unfloured surface and knead for 5-10 minutes until smooth and elastic. Place in a lightly oiled bowl and cover with clingfilm. At this point you can either set the dough aside for an hour or so at room temperature until doubled in size, or place it in the fridge overnight. The following morning, or once it has risen, divide the dough in half; shape each half into a ball, then roll each ball out into a 25cm round. Transfer one of the rounds onto a baking sheet lined with baking parchment, scatter about two thirds of the grapes over, the raisins, and half of the sugar, leaving a gap around the edge. Place the other round on top and press the edges together to seal. Cover, and set aside for 30 minutes to 1 hour to prove. It should be almost doubled in size and should spring back if lightly pressed with a finger; the dough will take longer to prove if it is cold from the fridge. Meanwhile, preheat the oven to 190°C/375°F/gas mark 5. Once the dough has proved, arrange the leftover grapes on top and sprinkle over the remaining sugar. Bake for 45 minutes until golden brown and cooked through, if it starts to brown too quickly cover with some tin foil, don’t be tempted to take it out early because it looks done on the outside, it may still be raw in the middle. Place on a wire rack to cool. Best eaten on the day it is made. That looks like a delicious bread and a great way to make use of grapes past their prime. I am always delighted to find such grapes, because it justifies cooking with them, and I think we need to use grapes more in cooking. For one thing, they freeze well, so you can always put off your project. I have found them a great addition to pies – mixed with other fruit like rhubarb, peaches, plums etc. They hold their form and texture, and add natural sweetness. Wonderful rescue of a dull grape!! The bread turned out absolutely gorgeous – I bet it would be nice with a little cheese too. Oh Hannah! You must have been standing in my mom’s kitchen the other day! My aunt has an abundance of grapes leftover, and they need to be picked very soon! We talked about what we could make with grapes, and like you said, there aren’t many options out there. I had mentioned pie, and everyone looked at me as if I had grown antlers out of my head! I cannot wait to print this up and show it to them!! You can bake grapes!! It looks divine. I’m wondering though… what does the texture of the grape become after it has cooked? Love this post!! <3 Awesome recipe!! I had never eaten cooked grapes before and thought that I wouldn’t like the texture seeing as I don’t like soft grapes but actually they are really nice! The inside just sort of turns into juice, some of them burst in the oven and ooze juice which turns into a sticky sauce with the sugar but I did have a funny moment where I bit into one that hadn’t burst and sprayed juice everywhere! 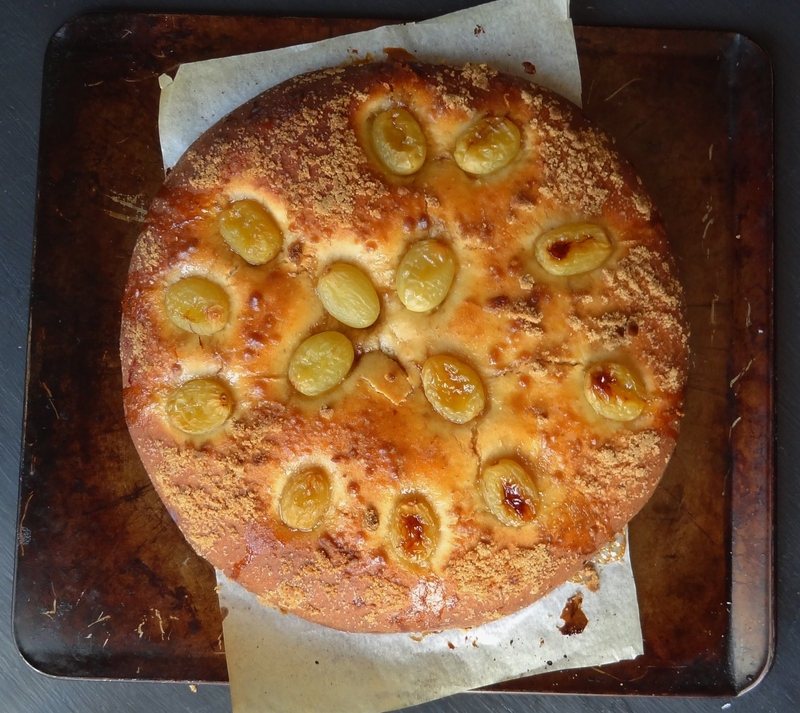 I did also come across a couple of grape cake recipes that looked quite tasty – might be worth a try if you have lots of grapes to spare!